Cable Zip Ties 4''+6''+8''+12'' Self Locking Nylon Cable Wire Tie Black for Home Office Garden Garage, Workshop by PAMAGOO at N Online Agency. MPN: CT01-B. Hurry! Limited time offer. Offer valid only while supplies last. Are you worry about messy wires? Are you worry about messy wires? Do you always fail in fixing the garden fence? Do you always feel helpless under some unexpected situations: e.g. unable to support in case of some sudden break? Now PAMAGOO cable tie will help you organize the wires, fixed or connect something in your home, garden, garage, office or farm! The Cable Matters Self-Locking 4+6+8+12-Inch Nylon Cables Ties are a great choice for a range of usage from securing small items to organizing home theater cables and others. Designed for indoor & outdoor use. Easily double the tensile strength by using 2 ties together in a row. 1.Excellent way to hang holiday decor like Christmas ornaments or garlands, tools, plants pots on railings without making any permanent damage/alterations to your structure. 2.Cost-effective pack include 4 sizes, with different lengths and thicknesses, so you have at least one tie suitable for the specific task at hand. 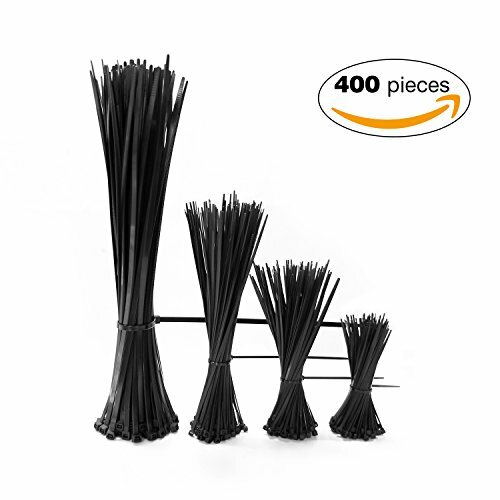 ★Multiple Length: 400 Cable Zip Ties include 100pcs * 4 inches cable ties, 100pcs * 6 inches zip ties, 100pcs * 8 inches plastic ties, 100pcs * 12 inches cable ties, Different length gives you more choices. ★Heavy Duty: 100% industrial strength 6/6 nylon with 1.3mm thick, Black Cable Zip Ties can be used to support heavier loads, and also it is adjustable & durable and easy to use. ★Heat & UV Resistant: Black Cable Ties are safe to use even when the cables ties or other objects get heated up inadvertently from time to time. Outdoor application in direct sunlight is OK! ★Wide Use: Doing a good job in the home, garden, garage, office and workshop. PAMAGOO nylon ties perfect for securing bags, cables, wires in tight places, fastening fence around the garden, temporary repairs, etc. Our cable ties will give you big surprise at every occasion! ★Our Warranty: Automated assembly line, do not worry about the number of shortages. We promise a 6 Months Warranty and 30 Days Money Back Guarantee. Please feel free to contact us if you have any questions. If you have any questions about this product by PAMAGOO, contact us by completing and submitting the form below. If you are looking for a specif part number, please include it with your message.